When I find a deal that is too good for me to pass up, I feel obligated to tell you about it - and today, is such deal. I have always been a fan of EmersonMade clothing and accessories. Everything made by this company is of great quality and super classy. However, as I look through their site, I'm always reminded of how great my taste must be - by that, I mean that my taste is so good, I can't afford a thing! Enter, the Emerson Tweed Jacket. I've had my eye on this jacket for over a year. It's simple but different enough that I could wear it with black pants, jeans, khaki's - really whatever! I've always thought it would be my 'go-to' jacket. It has been on my birthday and Christmas wish lists, however, at $238, I always moved it down the list because I had much more affordable, pressing wants. Enter, a really really great deal! Today, everything in the store is 30% off - INCLUDING gift cards. All you have to do is use the code 'MarvelousMonday' at check out. 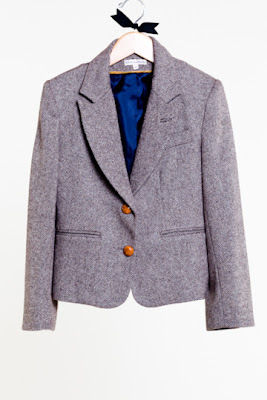 If you buy a virtual gift card and get 30% off and then turn around and use that gift card to buy the Emerson Tweed Jacket at 30% off, you can score this great jacket for only $116.60. That's over $130 off. Or look through the rest of the site - it is full of great goodies! And this leather and brass belt. p.s. if you decide to take advantage of this great deal, I'd recommend calling the company to make sure you'll receive your virtual gift card in time to make your purchase by the end of the day! Their number is 603-319-8361.